Learn more about care home fees in Northern Ireland. Researching care homes in Northern Ireland? The topic of care home costs is likely to be a key concern, with a variety of factors to consider. In essence, however, care home costs in Northern Ireland usually need to be funded by the person seeking care. This applies regardless of whether you are seeking care in a nursing home, where 24/7 nursing support is provided, or a residential care home, which tends to be less costly because it does not include nursing care. If you do anticipate the possibility of moving into a care home, you should first arrange a care needs assessment. Provided free of charge by your local authority, this assessment will identify the type of care best suited to your needs. The care needs assessment will also recommend if your needs can be met at home, or if you should be supported by specialists in one of Northern Ireland’s care homes. Depending on the outcome of the care needs assessment, you may be able to continue living at home. If that’s the case, we can help you understand the cost of domiciliary care providers in Northern Ireland. Care homes in Northern Ireland: do you qualify for funding? But even if you have less than £23,250 in capital, you may still be expected to make a contribution to your care home fees. A local Health and Social Care Trust decides the amount of money you should contribute to your care home fees. (See note 2.) So, if you have between £14,250 and £23,250, you will be regarded as having £1 of income, per week, per £250 of savings. Your required contribution will be based on this. If you have £14,250 or less, the trust will ignore your capital. Although the majority of care seekers in Northern Ireland will need to fund the costs of a nursing or residential care home, you don’t always need to sell your home to pay for care home support. Discover your options for paying for a care home if you don’t qualify for local authority funding. How much are residential or nursing care home fees in Northern Ireland? The average cost of residential home fees in Northern Ireland rang in at £516 per week during 2016-2017, according to Which? Elderly Care. (See note 4.) Meanwhile, the average cost of a nursing care home came in at £670 per week. This will vary from care home to care home, and depend on the level of care required. Looking to compare care homes in Northern Ireland? As well as care home fees, you’ll also want to consider the location, overall ratings and the perspectives of the person who is planning to go into the care home. 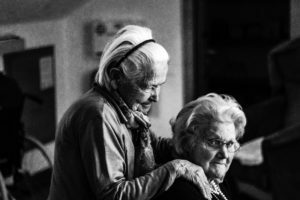 If you’re struggling to discuss the benefits of living in a care home with someone who might need care, get more advice for broaching the subject of care.